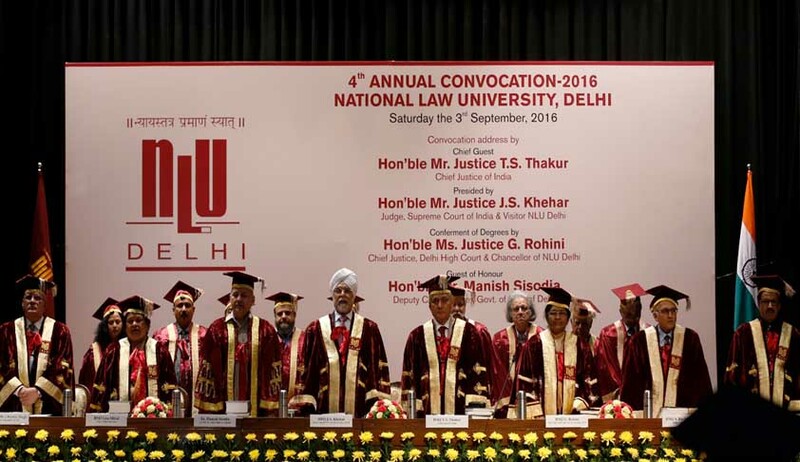 The Fourth Annual Convocation of National Law University, Delhi was held on the 3rd September 2016. Justice T.S. Thakur, Chief Justice of India was the Chief Guest and delivered the convocation address. In his convocation address, Justice Thakur spoke of access to justice, pointing out that a "speedy trial is a part of the right to life". He spoke of the many factors that are leading to delayed justice delivery, including the appointment of the proper number of judges and general upgradation of the justice delivery system. He told the graduates that "the ingenuity of a lawyer and ability to use the system should not result in abuse of the system". He encouraged them to remember that they are officers of the court and to conduct themselves with integrity. Justice Thakur also commended the large number of female gold medalists and remarked on the rising level of women being appointed as judges in the lower judiciary, pointing out that they have exceeded the number of male judges. He expressed his optimism this rise in number of female judges extending soon to the upper judiciary. The Vice Chancellor of NLU, Delhi, Professor (Dr.) Ranbir Singh highlighted the achievements of the university in his address. He criticised the prevailing system in law schools for its lack of research. He said that in addition to NLU Delhi’s reputation for being one of the best law schools for students in India, NLU Delhi is rapidly establishing itself as a centre of excellence for research. Professor Singh pointed out that NLU Delhi has several research centers which produce rigorous academic output that supports policy-making on wide range issues. These research centres provide students with valuable research and clinical opportunities. Since 2013, the National Law University, Delhi has received funding of over 20 crore rupees from Union Ministries and foundations to undertake research and capacity building activities on issues like information policy, death penalty and intellectual property. Justice J.S. Kehar, Judge, Supreme Court of India and Visitor of NLU, Delhi presided over the convocation and Mr. Manish Sisodia, Deputy Chief Minister, Government of NCT of Delhi was the Guest of Honour at the convocation. Justice G. Rohini, Chief Justice, High Court of Delhi and Chancellor of NLU, Delhi conferred the degrees to 73 successful students of BA., LL.B. (Hons. ), 47 students of LL.M. and three Ph.D. scholars. Apart from this 25 Gold Medals and 5 Cash Prizes to the students of B.A., LLB. (Hons) and 2 Gold Medals the students of LL.M. were awarded. Notable awardees are Mr. Amrutanshu Dash who was awarded 10 Gold Medals and 1 cash prize followed by Ms. Vaishali Singh who was awarded 6 Gold Medals and 1 cash prize. NLU Delhi students have received two very prestigious scholarships this year. Ms. Sanya Kumar of the graduating class will be commencing her studies as NLU, Delhi’s first Inlaks Scholar at Yale Law School and Ms. Rishika Sahgal of the class of 2015 will be reading law at the University of Oxford as National Law University Delhi’s first Rhodes scholar alumna. I consider it a matter of great honour to have been invited to deliver the Fourth Convocation Address of the National Law University, Delhi. This institution has grown into a great centre of learning within a short period of time. I am happy to know that students who have passed out from NLU, Delhi have brought accolades to this institution by clinching prestigious fellowships from Rhodes and Inlaks this year. It is also a matter of pride for this institution to see some of its students excelling in the Civil Services Examinations. One of the youngest who has cleared the examination and set high benchmarks for future batches also happens to be a former student of this University. Students from this University have topped Delhi, Punjab and Haryana Judicial Services examinations while several others who have passed out from here have been admitted to prestigious institutions in the West like Oxford, Cambridge, NYU and Yale etc. I take this opportunity to congratulate NLU, Delhi for these significant achievements under the dynamic leadership of Prof. Ranbir Singh your Vice Chancellor. Dear graduating students you have spent the formative and the most creative years of your life in this law school. I see and share your joy and excitement. It is obvious that you are all loaded with dreams, ambitious and aspirations while you step out of the portals of this law school ready to explore a multitude of opportunities and challenges that lie ahead. But my dear young friends, this day is also a day of some introspection and understanding the responsibility that you hold towards the society in general and your Alma Mater in particular. You must have been sufficiently trained to think on your feet more than merely doing legal research. This will, I am sure, help you in meeting challenges that come your way in your life ahead in which you must play the role of a crusade for justice fighting the grammar of anarchy, injustice, and inequality in all spheres of life. You must face the challenges which the contemporary world poses for the downtrodden, whether social, political or economic and steer the dynamics of change by being an instrument of constitutional values to which our country is wedded. You must be the hope of millions who suffer all kinds of wrongs silently, apart from, unfair treatment and denial of justice. You must help in building an inclusive society in which everyone gets his due regardless of his caste, race or religion. Your commitment to the ethics of the legal profession and to the rule of law will help this country progress and prosper. I say all this because most of the historic events of social change have been led by lawyers including the struggle for India’s independence. I, therefore, look upto you the lawyers of tomorrow to be the true guardians of the democratic and constitutional values for the benefit of the future generations. It is heartening to note that legal profession today attracts the brightest minds in this country. This is largely due to quality legal education which as a phenomenon started with the establishment of National Law School of India University in Bangalore in the late 1980s. The Judiciary, the Bar, the legal academia, the Legislature and the Executive have joined hands in making quality legal education in India socially relevant by enhancing its academic rigour. All this happened when best of the Indian minds were getting drawn to reputed law institutes of the West like Harvard, Cambridge, Oxford and Yale and the like. Even when the Law Departments and Law Colleges affiliated to the Universities in India are churning out large number of law graduates, most of them lack the academic atmosphere and research facilities that are necessary for any centre of excellence. Establishment of the National Law Schools offering an integrated five years law course with compulsory residential programs in that background has had a salutary effect and raised the standard of legal professionals, judicial officers and judges of High Court in this country. Resultantly the quality of justice has also improved to the benefit of the litigant public. It is, however, time for all of us to think about the growth of centers of excellence in legal education and endeavour to provide world class institutions in legal studies. We need to plan and work towards creating the generation next legal education within our country especially when we have the human and other resources requisite for doing so. Contribution of the students passing out from institutions like NLU, Delhi will be as important and valuable in this regard as any other. Graduating students need to remember that they owe a debt of gratitude to their Alma Mater which can be repaid only by continued association with the institution that has given them so much. This is essential because globalisation and expanding legal markets beyond national boundaries necessitate that we prepare our law students with adequate focus beyond the Indian Legal System. We need to impart sophisticated skills to our law students and equip them with transnational problem solving abilities. Expanding global market by virtue of diversification of international business transactions and international trade, global operation of banks and manufacturing industries transcend national boundaries. Each of these multi-national transactions are based on multi-lateral legal obligations for which India needs competent law graduates to comprehend laws of diverse jurisdictions and to render effective service. It is in this context that law Schools need to fight domestic insularity in developing their curriculum to globalise legal education which is the need of the hour. Dynamics of legal education, we ought to remember is one of the major challenges in this country. I would, therefore, take this opportunity to urge the law professors to revisit the curriculum of various courses taught in the law schools and suitably upgrade them to suit the international market. Let us not forget that even National Law Schools, despite the advantage they have over other schools and colleges offering legal education require a generational change to compete with the Western Centres of Legal Studies. While law schools and Universities may continue to satisfy the need of the legal profession, National Law Schools need to focus on producing a new class of law graduates equipped with the legal knowledge and research capacities to match their counterparts from the West. This would enable the young Indian law graduates to effectively compete for coveted positions that are emerging in the global legal market. Dear students, access to justice has been declared as a fundamental right by the Supreme Court of India in Imtiyaz Ahmad vs. State of U.P [2012 (2) SCC 688] and Anita Kushwaha & Ors. vs. Pushap Sudan’s [2016 (7) SCALE 235] cases. The right comprehends a mechanism for adjudication that is reasonably accessible in terms of distance and a process that is affordable to the litigants. But more importantly, implicit in the right to access to justice is the speed at which the process of adjudication must be completed. The adjudicatory process in the courts today is taking unduly long time, which more often than not defeats the right itself. There are several factors that contribute to this situation. All of us know the reasons behind the same but lawyers as major stakeholders in the adjudicatory process owe a professional and moral obligation to ensure that they do not become an instrument for denying or delaying justice to the litigant. Remember that while the interest of the client is what you are expected to protect, as an Officer of the Court, you should never contribute to the delay in adjudication of the disputes. Lawyers very often are accused of being responsible for the delay in the disposal of cases which in turn defeats justice. That is neither professionally nor morally correct for one who is committed to upholding and ensuring justice. Remember that you are an active participant in the judicial process and in that capacity no part of the blame for any delay should fall on you. With the cooperation of the bar the performance of the Judges will also improve, as the quality of justice is directly proportional to the quality of assistance which the bar provides to Judges.In conclusion, I congratulate the graduating students on this memorable day in their lives and compliment the members of the faculty who have shaped them to face the trials and tribulations of the life head. May God bless you all with success in whatever you do. This University who has shaped you for the struggle ahead shall legitimately feel proud of the fact that you passed out from its portals to seek your destiny and all that goes with it.